An ever-so-slightly disturbing holographic image of John Madden greets you upon loading Madden '09...but don't worry. He's here to help. The old coach wants to grab your attention, toss you a few pointers, run you through some drills, and BOOM! - make you a better player. Aside from a fairly impressive graphical upgrade, this year's Madden is all about making it easier to play this year's Madden. To that end, EA has added several new features to help players learn the basics of running, passing, and defense. After greeting you Princess Leia-style, Madden sends you to the new virtual Training Center where you can "fine-tune your game in a holographic environment." This hyper-spare, Tron-like atmosphere is apparently intended to focus your attention on the skill you are assigned to practice, rather than the distracting details of the stadium or the uniforms of the other players. Once you start playing real games, the Adaptive Difficulty Engine steps in to "assesses your proficiency in the core skills areas of football, then tailors the experience to match your playing style." Theoretically, this means if you're a lousy player the AI will go easy on you, but if you're a skilled veteran, you're in for a fight. Madden '09 also helps you learn from your mistakes. The BackTrack feature "provides customized feedback, giving you a chance to learn from your mistakes." The voice of Chris Collinsworth pops up whenever you throw an interception, for example, and explains what you did wrong and what you could have done better. You then have the option of using "EA SPORTS Rewind" to reverse time (Braid-style!) and run the play over again. Finally, Madden '09 employs in-game button hints that appear beneath players you control, reminding you to make use of their special skills or strengths. Each of these new features can be turned on or off, and some can be controlled, such as limiting the number of rewinds each player may use per game. I haven't played enough Madden '09 to evaluate how well any of these new additions work, but I'm intrigued by EA's strategy of building them into its most lucrative franchise. I'm not keen on revisiting my "this game is too hard" series of conversations about Braid, but as several commenters pointed out, the Madden series has grown increasingly complex over the years - far more difficult to pick up and play than Braid, or most other games for that matter. In case you're not familiar with Madden, here are the controller instructions for only the offense. The defense has its own separate set of controls. You're gonna need that PgDn button. Triangle Button Cancel an audible call (before selecting an audible). Hot Route to a different receiver: Triangle then the button corresponding to the receiver, then press: Directional Button UP = for a fly pattern, DOWN = for a curl pattern, LEFT/RIGHT = for an in/out pattern, L2 or R2 = for a left/right slant pattern, or Right Analog Stick DOWN for a Smart Route. You may also press the Left Analog Stick to change the receiver's route. L1 Button Slide offensive line protection: L1 then Direction Button UP = spread line, DOWN = pinch line, LEFT/RIGHT = shift blocking left/right. Left analog stick (L3 Button when pressed down) UP/DOWN to highlight eligible player then Left Analog Stick LEFT/RIGHT to send that player in motion. Right analog stick (R3 Button when pressed down) LEFT/RIGHT = Switch the direction of a running play. LEFT/RIGHT or UP/DOWN = Hot Route primary receiver. Square Button (Tap) Slide / (Hold) Dive (QB). Right analog stick (R3 Button when pressed down) Up = Big Offensive Hit. Down = Back Juke. X Button Sprint. Pass to the receiver with corresponding icon. Tap for lob pass; Hold for a bullet pass. Triangle Button Catch. Pass to the receiver with corresponding icon. Tap for lob pass; Hold for a bullet pass. Square Button Dive for pass. Pass to the receiver with corresponding icon. Tap for lob pass; Hold for a bullet pass. Circle Button Control intended receiver while ball is airborne. Pass to the receiver with corresponding icon. Pull and release quickly to lob pass; Tap for lob pass; Hold for a bullet pass. L2 Button Throw ball away (tap). QB scramble behind the line = Hold L2 + Square, Circle, L1, R1, or R2. L1 Button Swat ball. Pass to the receiver with corresponding icon. Tap for lob pass; Hold for a bullet pass. R2 Button Lock on to receiver: Hold R2 + corresponding receiver button. Pump fake (tap when passing icons are up). Pass to the receiver with corresponding icon. Tap for lob pass; Hold for a bullet pass. R1 Button Pass to the receiver with corresponding icon. Tap for lob pass; Hold for a bullet pass. X Button Sprint. Power Block. Triangle Button Jump. Change blocking assignment before the snap: Triangle then press the button corresponding to the running back or tight end whose passing/blocking route you want to change. Press L2 to change to a blocking assignment to the left. Press R2 to change it to the right. By the way, these are the instructions for Madden '06. Madden '09 throws in a few more. This is all terribly complicated, of course, but if you're willing to devote yourself to the game for a few hours, the commands eventually become second-nature, as is the case with many games. And as many Madden aficionados will attest, these complex controls give the player more, ...well, control. 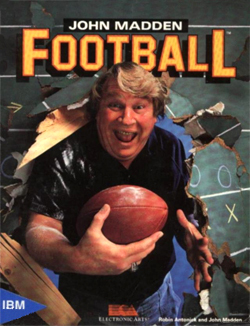 My real interest is in the message EA is sending with its flagship sports game. It has clearly decided to design into the game a responsive system for dealing with players of various skill-levels. While we've had Easy, Hard, and Expert modes (and their variants) for years in video games, EA appears to be taking this to another level. Obviously, big caveats and yellow caution flags go up whenever developers make the kinds of claims EA is making about the new user-friendly Madden. I can't personally verify how well these new features work...though I look forward to finding out. But I'm intrigued by the notion of games leveraging their own mechanisms to teach us things. Typically this has served a tutorial function, teaching the player how to play the game itself. But if a game can be smart enough to do the things Madden '09 wants to do, I can't help but wonder: what else might it teach?